Another camp-like project that Rabbi Weber organized was a nine-day Pesach seminar for students in the See the Light program. Convening in the old shtetl town of Vyzhnytsia in the Carpathian Mountains near Chernivtsi, the seminar attracted 80 young men and women, most of whom were from Dnipropetrovsk, although some were from Kyiv, Poltava, Zhytomyr, and other places in Ukraine. (The capacity of the seminar was 120, said Rabbi Weber.) The program included lectures on Jewish tradition, training in Jewish religious practice, social activities, and sports. Participants paid the equivalent of about $70 in seminar fees, an amount that can be submitted in installments over several months. The total cost of operating the camp was $50,000, Rabbi Weber said. His major project in adult tourism, said Rabbi Weber, is utilizing the Menorah Center as a base for hasidic groups from Israel and North America who wish to explore the Ukraine-based heritage of their own movements. Not only Chabad, but also such groups as Vyzhnytser and Gur hasidim have important shrines and other points of interest in Ukraine. Followers of such movements come to Dnipropetrovsk in charter flights from Israel. They stay in the Menorah Center for four days of study and worship with their own rebbes, where they are assured of kosher food and suitable hotel accommodations, and then go to their shrines. Because Rabbi Weber assures that all of their needs are met, hasidim are now visiting Dnipropetrovsk and other Ukrainian venues as an alternative to Sfad in Israel, especially during the Shavuot holiday. 33. The Dnipropetrovsk office of the Jewish Agency for Israel (JAFI, Sochnut) serves as headquarters for Jewish Agency operations in all of eastern Ukraine. The writer met with the immediate past director Ilana Shpak and the new current directors, Natasha Nabitovsky and Max Lurie just a few days after the latter two had arrived in Dnipropetrovsk from Israel. Ms. Shpak, who already had assumed responsibility in her new JAFI post in Kyiv, had returned to Dnipropetrovsk to assist Ms. Nabitovsky and Mr. Lurie, a married couple with several small children, in accommodating themselves to their new positions. Ms. Nabitovsky directs JAFI operations in Dnipropetrovsk and certain smaller Jewish population centers close to that city, whereas Mr. Lurie is a roving emissary whose primary responsibilities are the Kharkiv area to the north and the Donetsk/Luhansk area to the east. Natasha Nabitovsky and Max Lurie, the couple at left, had arrived in Dnipro-petrovsk from Israel just a few days before the writer met them in late March. Ilana Shpak, at right, who was the previous JAFI director in Dnipropetrovsk, had already moved on to Kyiv, but returned briefly to Dnipropetrovsk to orient the new emissaries to their positions in eastern Ukraine. Jewish Agency premises are located in the Menorah Center and include a small multi-purpose room, several conference rooms, a computer room, and offices. When additional space is required for specific programs, JAFI rents Menorah Center facilities by the hour at the discount rate available to non-profit organizations. 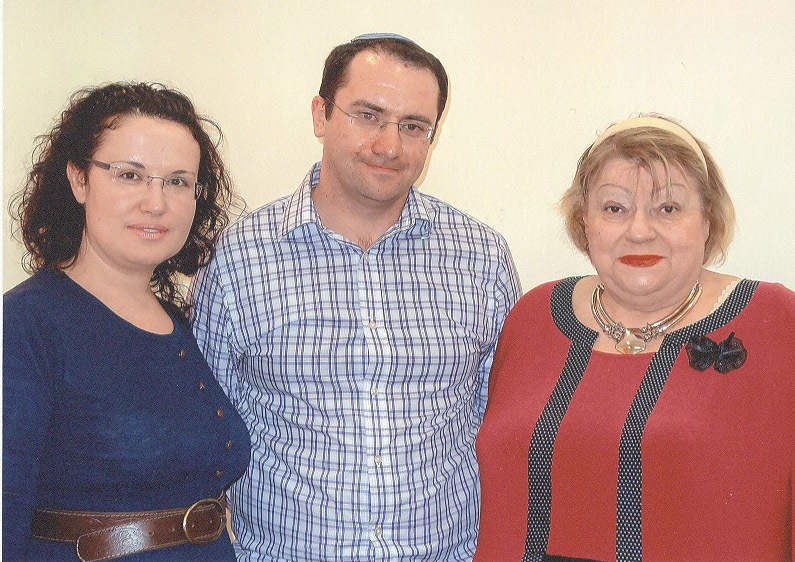 Jewish Agency goals in its post-Soviet operations are to strengthen the Jewish identity of local Jews, bolster ties between local Jews and Israel, encourage aliyah (immigration) to Israel, and develop local Jewish leadership. The current situation in Ukraine has generated new interest in aliyah, both among those who have been active in the Jewish community for some years and among many people who have never participated in Jewish life previously. 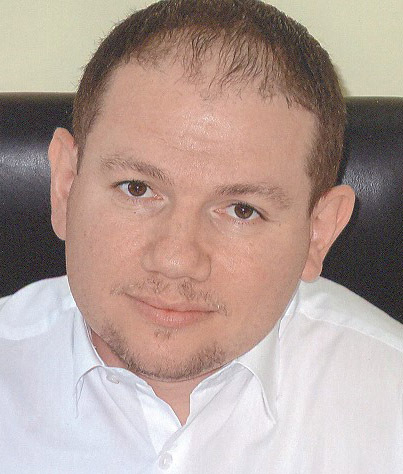 Indeed, aliyah figures in March 2014 from the Dnipropetrovsk region increased almost 467 percent over those from March 2013 and notable increases were reached in JAFI offices in Odesa, Kharkiv, and Kyiv as well. Ms. Shpak expressed relief that, after moving its eastern Ukraine consulate from Dnipropetrovsk to Kharkiv one year previously, the Israeli government had attached a part-time consul to its Israel Culture Center in Dnipropetrovsk a few months ago. Although the part-time consul is based in Kyiv and is in Dnipropetrovsk only two weeks each month, his presence simplifies the aliyah process. Potential olim are able to check documents and receive Israeli entrance visas in Dnipropetrovsk instead of traveling to Kyiv, a journey that is costly and time-consuming. The current political and economic crises in Ukraine have generated many new inquiries about aliyah to Israel, noted Ms. Shpak. Since the recent upheaval, she continued, many of those visiting JAFI offices have had no previous contact with any Jewish organization. They are very unsophisticated about Israel as a country. It is unlikely that all of them will make aliyah, she predicted, but they want to be prepared if they feel that they must leave Ukraine. At any rate, aliyah is a process, she stated; people need time to explore their own situations and absorption options in Israel, make decisions, and plan their futures. The increase in aliyah, Ms. Shpak stated, has strained the system of immigrant absorption in Israel. Clearly, Israel needs new programs to absorb professionals, that is, programs that combine Hebrew language instruction with classes that teach new olim (those who have made aliyah) how to upgrade their professional skills and apply them in the Israeli economy. Young people who have had experience in Israel on Taglit (birthright Israel) and MASA (more extensive programs) know exactly what they want, she continued, demanding positions and housing only in the large cities; they will not settle for housing in nearby towns, even as "starter" accommodations. Israel simply cannot meet their demands. About 80 young people from the Dnipropetrovsk area participated in JAFI Taglit pro-grams in 2013, along with others who joined Taglit through Hillel and other organ-izations. MASA attracted 60 young adults to Israel programs last year, Ms. Shpak said. The JAFI Youth Club in Dnipropetrovsk engages approximately 120 students on a regular basis, and similar clubs in Krivoi Rog and Zaporizhzhya attract 50 and 40 students respectively. The Meod program (incubator projects combined with elements of the Stockholm-based Paideia curriculum) has three constituent groups of young adults in Dnipropetrovsk and one in Krivoi Rog, said Ms. Shpak. JAFI also remains in contact with Taglit alumni, sponsoring events and programs when financial resources permit. Almost 200 youngsters from eastern Ukraine attended JAFI summer camps in 2013 and a modestly larger group is expected in 2014, Ms. Shpak stated. Another program focusing on children is secular Sunday schools that operate in Dnipropetrovsk and Krivoi Rog, each enrolling 20 youngsters. 34. The American Jewish Joint Distribution Committee maintains its eastern Ukraine regional headquarters in a Dnipropetrovsk office directed by Yoni Leifer, an Israeli who assumed the position in December after similar posts in Belarus and Kaliningrad. In Belarus, he was stationed in Minsk and had certain diplomatic responsibilities, he noted; in Dnipropetrovsk, this portfolio component is missing. Yoni Leifer directs JAFI operations in a large area of eastern/southeastern Ukraine. His office is located in a small commercial building that is separate from the JDC hesed. Referring to the relocation of Hesed Menachem from its former building to the Menorah Center in February 2014, Mr. Leifer said that he had been somewhat ambivalent about the move at first. He had feared that the "luxe" atmosphere of the Menorah Center would stain the image of the hesed and of JDC generally; perhaps, he continued, clients would feel uncomfortable in such upscale surroundings. Further, the space available to JDC was one-third smaller than that available in the older building. However, it is important that the hesed be in the "Kaminezki building" for the sake of maintaining community spirit, JDC decided. It turns out that clients are very happy being in the middle of a busy community structure, and proximity to other program areas - such as the Hillel computer center - has created many benefits for older clients, Mr. Leifer said. He observed that many hesed grandparents sometimes see their grandchildren in JCC or other activities. The Menorah Center staff was very helpful to the hesed and clients during the move-in period and remains attentive to the needs of these older adults. Although the space limitations of the new premises are real, Mr. Leifer stated, they have managed to find room for everything. The JDC client caseload throughout the region - including Dnipropetrovsk, Krivoi Rog, Donetsk, Melitopol, and several other cities - includes 18,240 individuals, 3,000 of whom receive home health care. Homecare is very expensive; in fact, explained Mr. Leifer, it accounts for 85 percent of the budget. Of the 18,240 total clients, Mr. Leifer continued, 39 percent are considered Holocaust victims and, as such, receive services subsidized by the Conference on Jewish Material Claims against Germany. With the passage of time, the number of Holocaust victims diminishes and the resources provided by the Claims Conference are reduced accordingly. Whereas the number of clients eligible for such assistance once exceeded 80 percent of all clients, said Mr. Leifer, the current ratio of 39 percent is expected to lessen further as more survivors die. The supplemental funding provided by the Claims Conference enables a much more generous package of services to constituents; for example, Nazi victims receive 25 hours of homecare each week compared with ten hours of homecare for individuals who were not affected by the Holocaust. Similarly, Nazi victims receive a monthly allowance of $25 for food purchases, where as non-victims receive one payment of $25 every three months. In response to a question, Mr. Leifer said that state pensions are still being paid on time, but that inflation has eroded their value and the resulting loss of income has become very burdensome for many seniors. The average pension for hesed clients was 17,612 hryvnia in March, which now (end of March) is equivalent to about $161. A few months ago, the value of the average monthly pension was $220. As gas prices are due to increase on April 1, everything that is transported by road vehicles will rise in cost. At some point, said Mr. Leifer, JDC would like to introduce a fee for service system that would require clients to pay at least a partial cost of certain services that they receive. Perhaps the fee structure would be graduated for seniors according to their ability to pay and, of course, such a system must be introduced gradually. Apart from JDC welfare services, Mr. Leifer noted briefly a JDC Jewish community center program that soon would move from the old community building behind the synagogue to the Menorah Center, the JDC Tikvah program for people with disabilities that already is in the Menorah Center, and the Metsuda young leadership program that offers five seminars throughout the year, each one in a different part of Ukraine. JDC needs to engage more young professionals in leadership development programs, he stated. Nonetheless, when asked by the writer, Mr. Leifer said that JDC was not contemplating the granting of local management authority to local individuals. He observed that a hesed Board of Directors exists, consisting of ten to 12 individuals, but he did not define the responsibilities of this group. Statistics from the Jewish Agency for Israel. Dnipropetrovsk Hillel also enrolled 80 in Taglit in 2013. See page 23. Along with encouraging the creation of new programs for the Jewish community through an incubator project, a major objective of Meod is the cultivation of leadership interests and skills among participants. The Jewish Agency has developed many of the young professional leaders in contemporary Ukrainian Jewish organizations through such programs as Meod and leadership development programs related to counselor positions in JAFI summer camps. JAFI Taglit alumni also participate in programs with Hillel Taglit alumni in Dnipropetrovsk (and in other cities). Kaliningrad is a Russian "exclave" located some 200 miles east of the Russian border between Poland and Lithuania on the Baltic Sea. Approximately one-half the size of Belgium, Kaliningrad was part of east Prussia and known as Königsberg prior to being given to the Soviet Union at the Potsdam Conference that divided Europe in 1945. The territory subsequently was renamed Kaliningrad in memory of Mikhail Kalinin, a Bolshevik revolutionary and nominal head of state of the Soviet Union from 1919 to 1946. Technically, JDC could have elected to rent larger premises in the Menorah Center, but declined to do so for reasons of cost. See pages 36-40 for a description of JDC hesed and family service operations in Dnipropetrovsk. See pages 33-34 and 39-40 for information about the JDC Jewish community center program and the Tikvah program respectively.